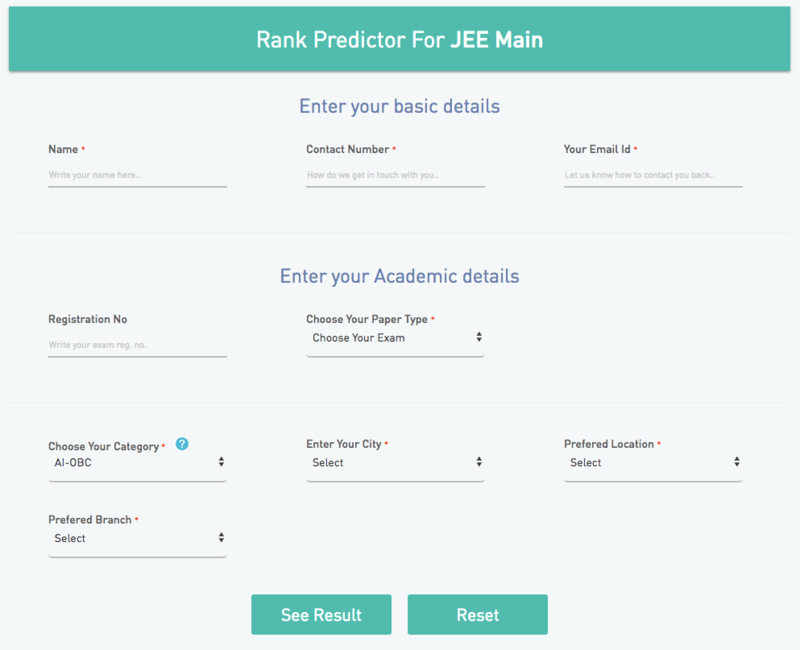 How to Predict Your Rank using JEE Main Rank Predictor? Home / Education / How to Predict Your Rank using JEE Main Rank Predictor? The first session of JEE Main was conducted in January and the second session of the examination will be conducted in April. The examination will be held from April 7, 2019, to April 20, 2019. Almost 15 lakh candidates have registered for the exam, which will be held online in different centres in various Indian cities. The results for JEE Main April session will be declared on April 30, 2019. Since 2019, NTA will be releasing the JEE Main result for both the sessions in the form of percentile, instead of ranking students based on their raw scores. Candidates can use JEE Main Rank Predictor to predict their rank. The Percentile score is calculated by a candidate’s performance concerning other candidates appearing for the exam. The marks for each session will be converted to a scale of 100 to 0. The normalization of scores will be done for all the subjects as well as for the overall score obtained in the exam. The ranks will be based on the best of the two percentile score for two attempts and not the raw score. For single attempt, the raw score will be simply normalised into the percentile score. The admission process will be conducted based on the ranks and not on the percentile scores. Aspirants who are going to appear for the April session of JEE Main 2019 can check their probable ranks usingJEE Main Rank Predictor tool before the final results are declared. Students can check their correct answers and calculate the raw scores from the official answer key released by the NTA. Then they can use a rank predictor to assess their chances of getting admission in the engineering colleges. With the help of a rank predictor, aspirants can estimate their performances in the examination or confirm whether they will be eligible for JEE Advanced examination. The JEE Main Rank Predictor tool uses a special algorithm similar to the formula used by NTA to calculate ranks based on percentile score. The results may or may not be 100 per cent accurate, as the rank will be predicted based on the expected raw score and the candidate’s input. However, students can get an idea about their performance and prepare for JEE Advanced examination. The expected percentile score to be eligible for JEE Advanced is 89.5. Students can score between 1 to 60 if the percentile score is between 100 and 99.996. So, a percentile score of 89 can mean rank of 164999. The rank predictor tool for JEE Main will need some details about the candidate to calculate the probable ranks. You can also view a list of colleges that you can expect to get admission to. After submitting all the details candidates can view their probable ranks and the expected colleges. Students aspiring for JEE Advanced can predict their performances and check if they are eligible for the examination that is scheduled to be conducted on May 19, 2019. Students can view some of the colleges that they can get admission to, based on their score and rank. Students can check their eligibilities for IITs, NITs and GFTIs. Things to Remember Students can use the JEE Main rank predictor to get an estimate about their JEE Main performance. However, the final result can vary from the predicted rank. The admission to colleges and eligibility for JEE Advanced will depend on the official cut off decided by the NTA. Any student scoring below the cut off will not be considered for final admission.